It’s so hard to believe we’re almost full swing into the Holiday season. It’s amazing how fast it comes every year! 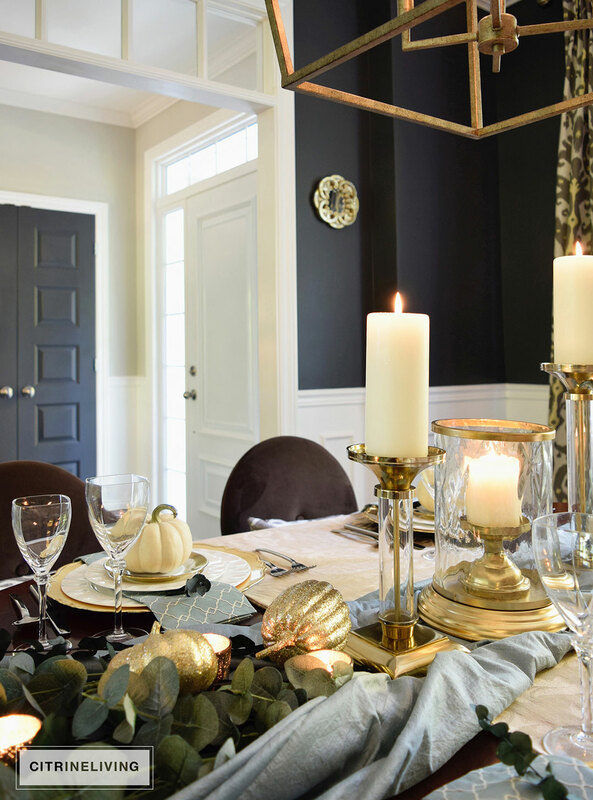 This week I’m very fortunate to be joining a fantastic group of blogging friends to bring you Styled + Set : A Holiday Entertaining Blog Tour, hosted by the talented Lory of Designthusiasm. 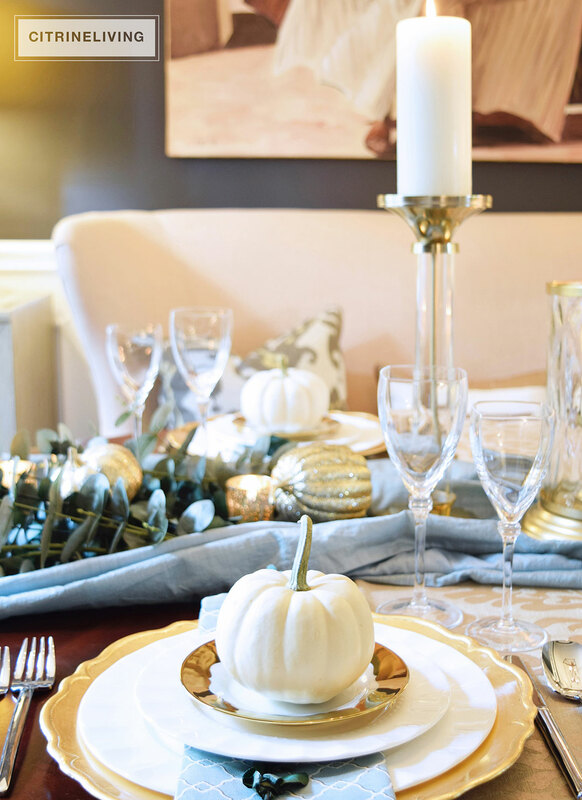 Everyday this week, a different group will be sharing their ideas for Thanksgiving entertaining, and we’ll be doing it again next month for Christmas. All of the links are shared at the bottom of my post, please visit the full lineup throughout the week so you can enjoy all of the fabulous inspiration. 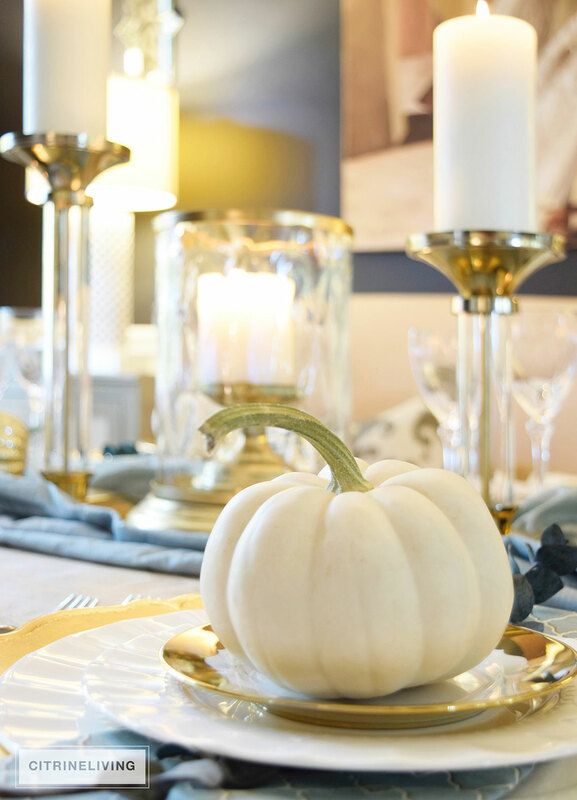 Our family gets the best of both worlds: we celebrate both Canadian and American Thanksgiving, and there’s plenty of gathering, laughing and of course eating together with all sides of the family. 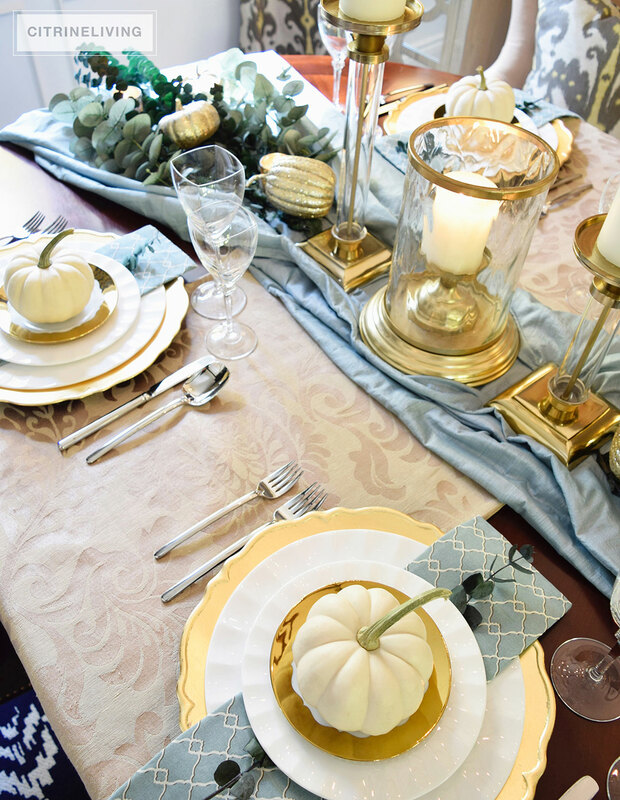 Today’s gold and aqua Thanksgiving table is very different from the one I shared a couple of weeks ago for our northern celebration – a red, pink and coral table, infused with my favorite blue and white (below) – you can find more of this unexpected tablescape here. Tablescaes are an artform for me. I love to find different ways to express my creativity and individuality and I love to encourage others to do the same. 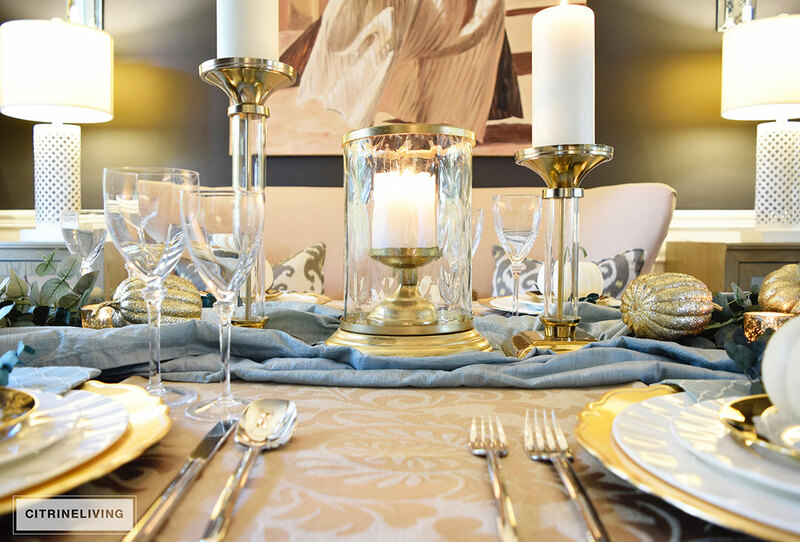 There’s nothing stopping you from looking around your home and bringing elements to the table that you wouldn’t normally think of. 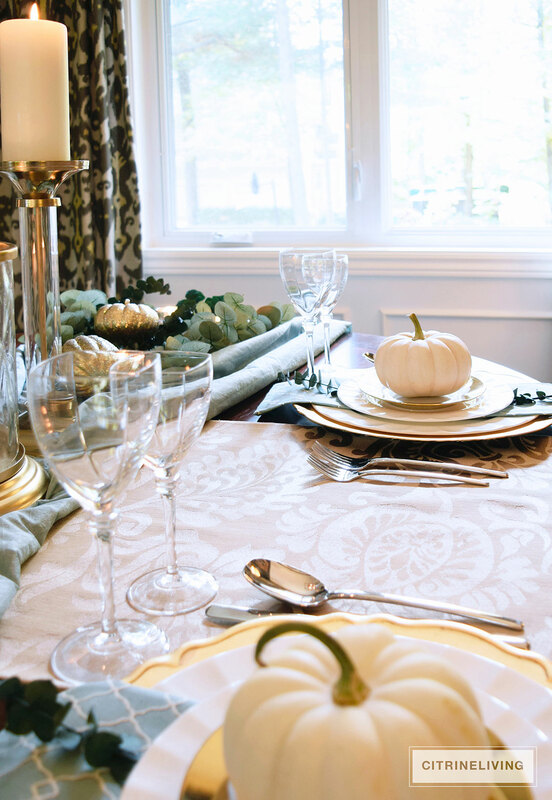 I shared a red, purple green and gold table here for my Fall home tour. 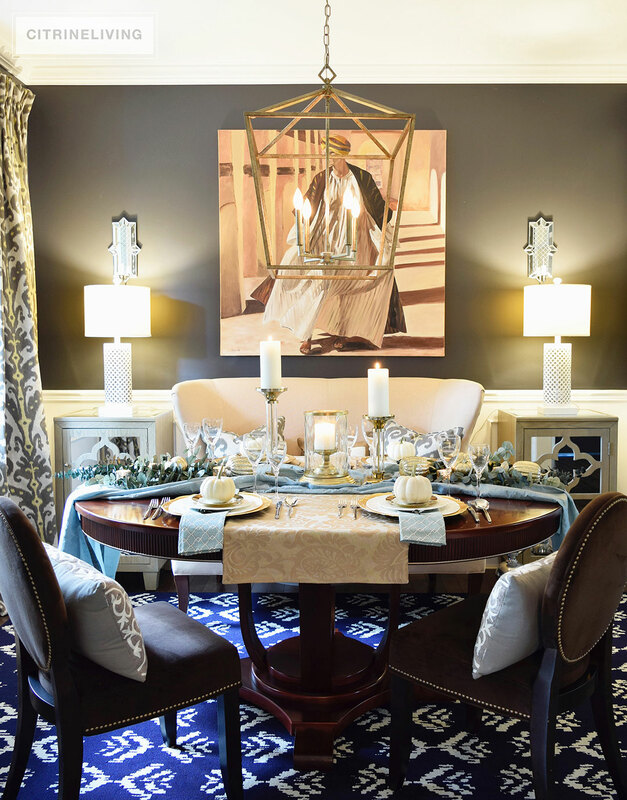 One of my favorite tables ever, uses my go-to color palette of blue and gold – find it here. 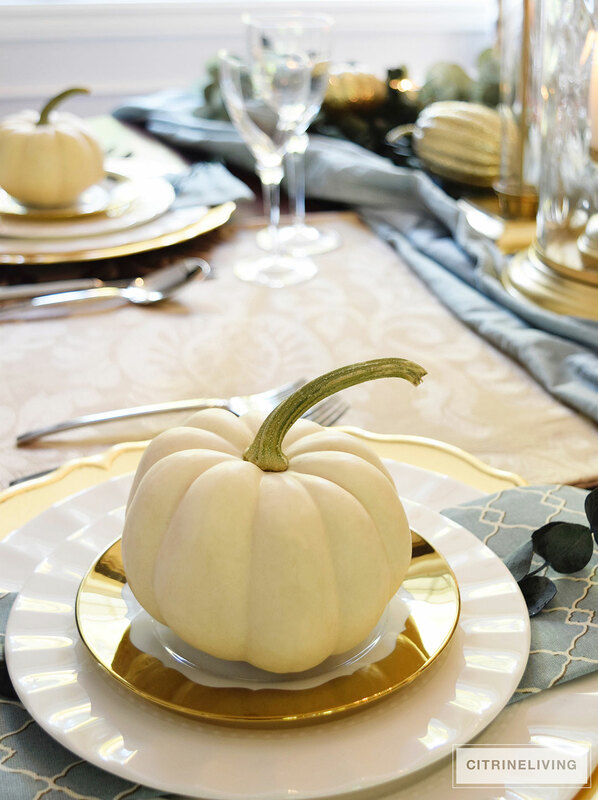 I also have a roundup post, which you can find here, with a year’s worth of tables as an inspiration post full of quick and easy table ideas. Now let’s get back to today’s table! I wanted to create something a little more rustic, with the feeling of being outdoors, and a touch of glam for this tour. 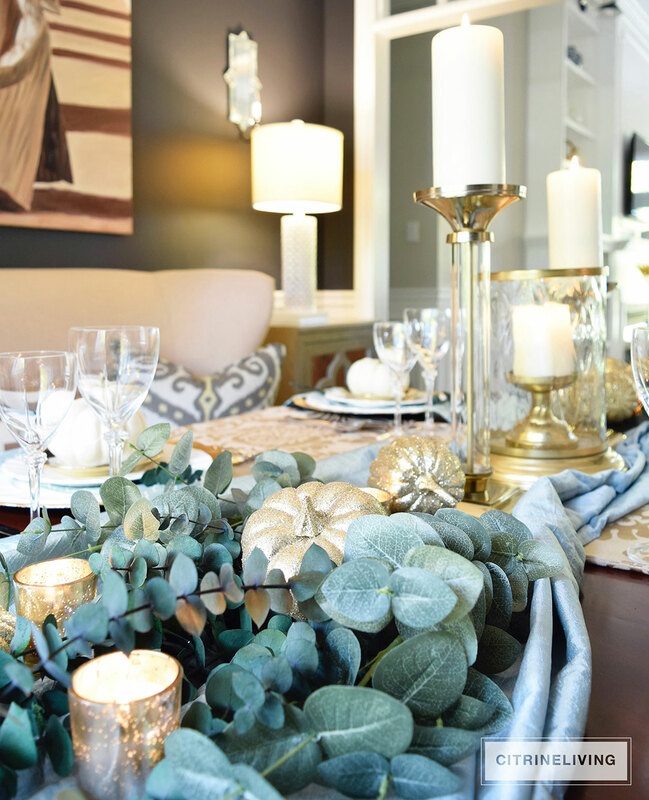 I started with eucalyptus – both real and faux – to anchor the table. 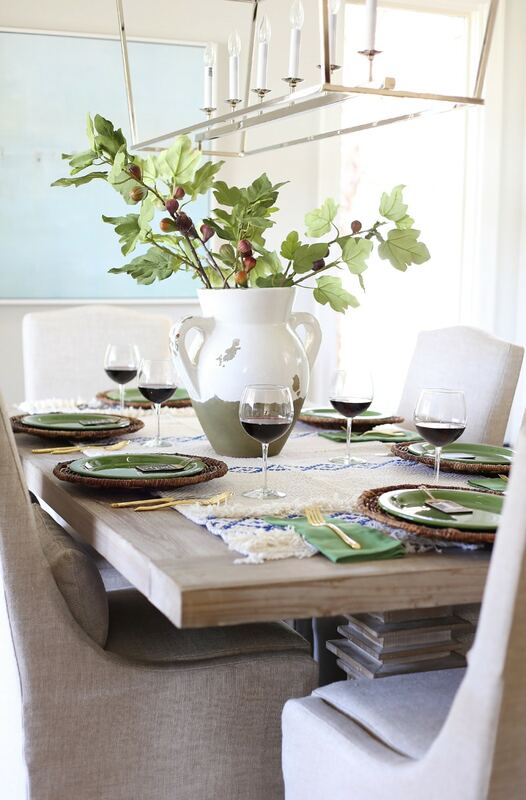 Aqua tones marry together with the many gold elements and play off the blue undertones of the eucalyptus. 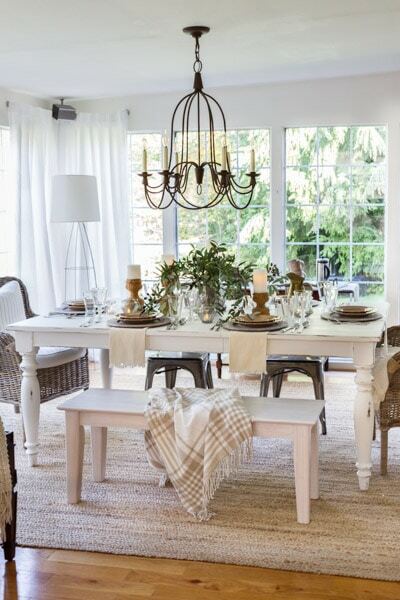 The white details add some crispness and keep it all from feeling too heavy. 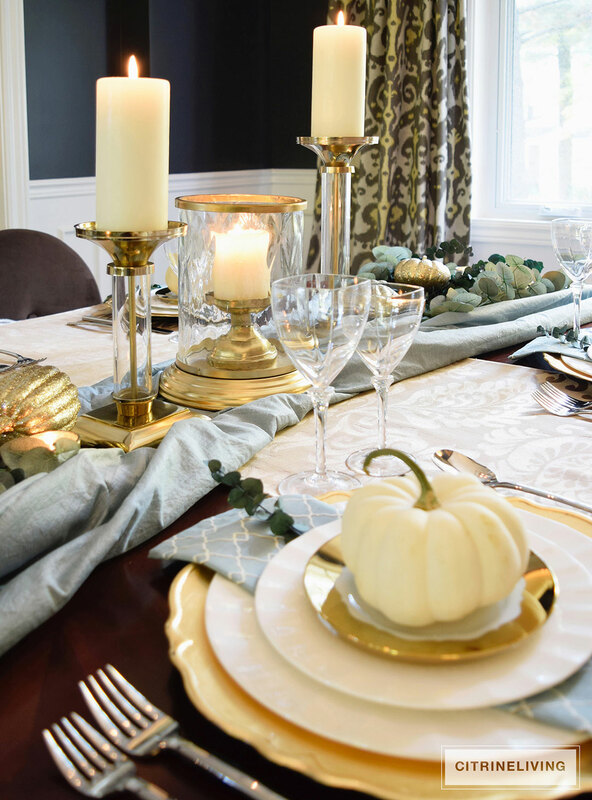 I use gold and brass in many of my tablescapes, as well as throughout our home and it’s very common to see many of my items in rotation throughout my posts! 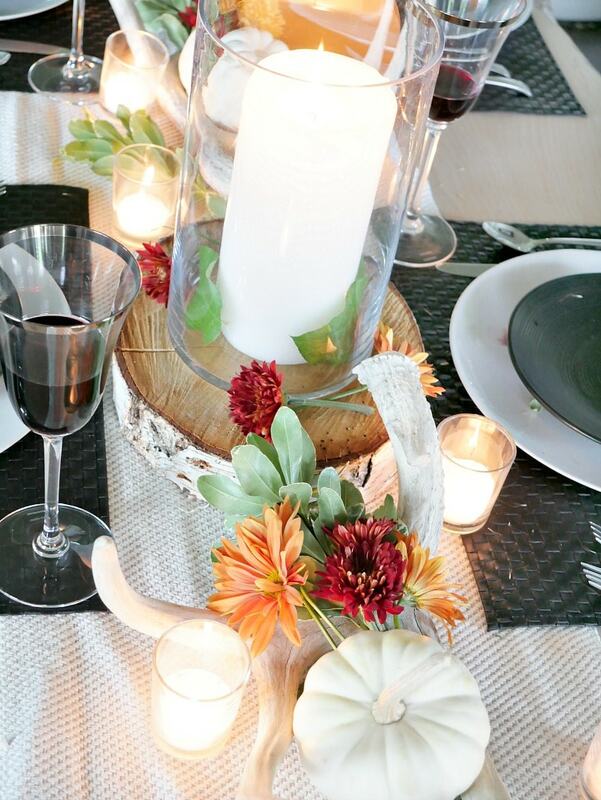 As much as I love florals, I don’t always use them on my tables. 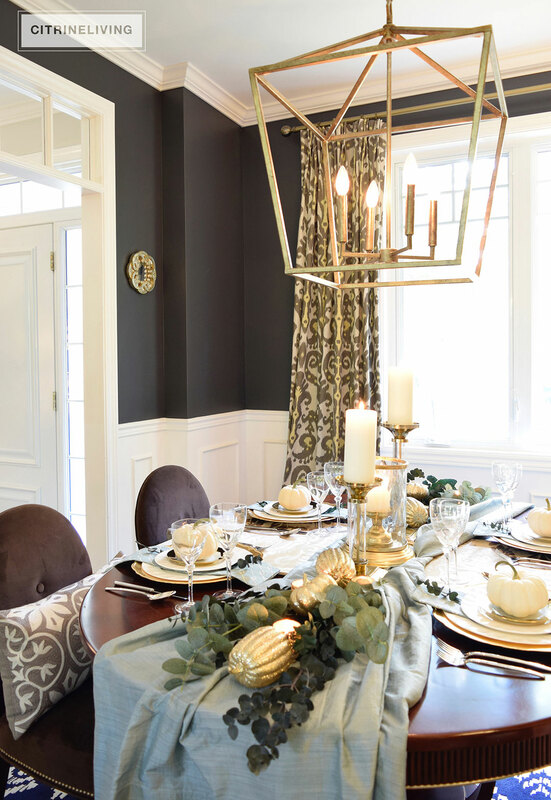 I’ll often use a lantern or vase as a focal point and build from there. 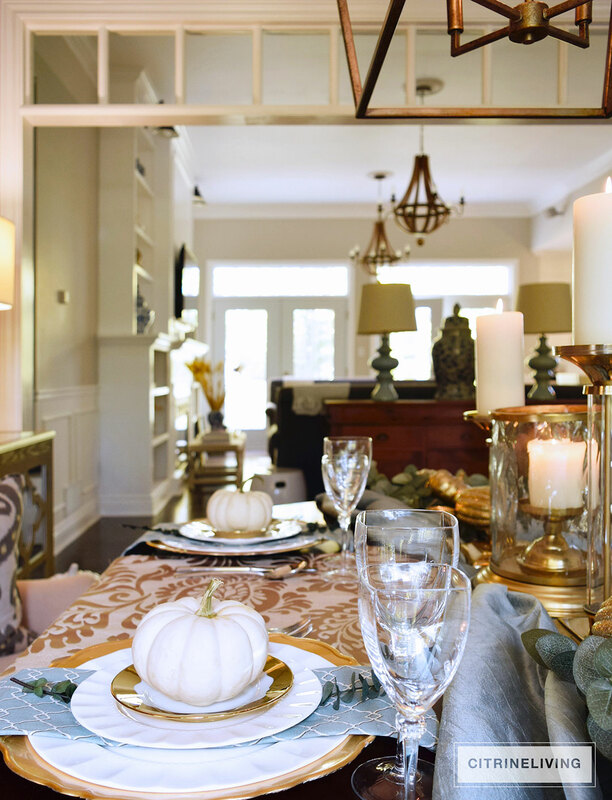 With the eucalyptus running through the center, I wanted to counter balance it with the lantern and large candleholders. 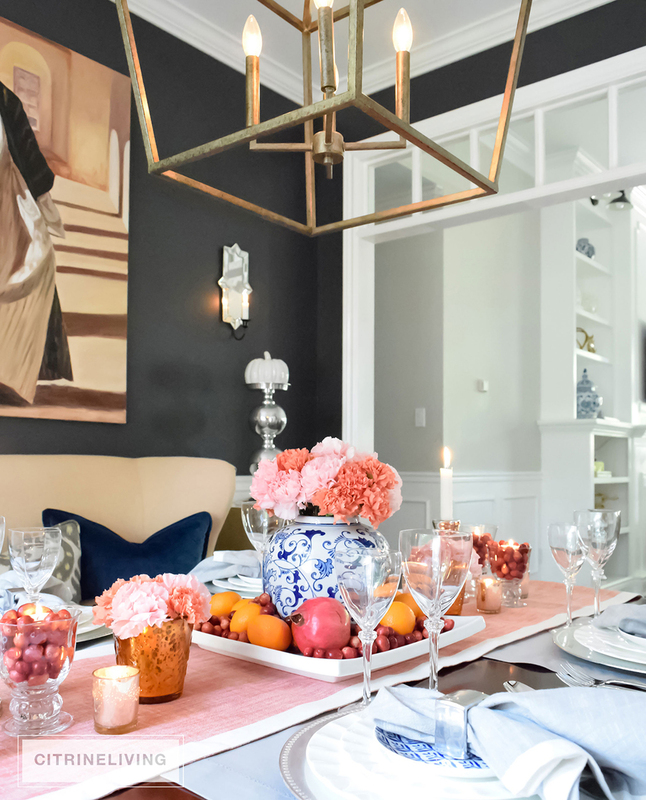 I also love to use faux florals, which many people shy away from – there are so many fabulous varieties that you can find now, the possibilities are endless. You can see how I used them here, on my Spring table. 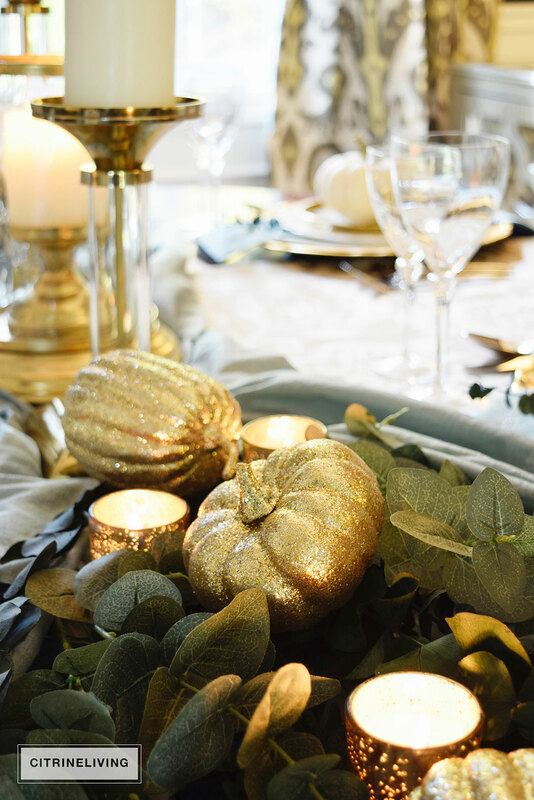 Glittery gold pumpkins provide reflection and light against the deep tones of the eucalyptus. 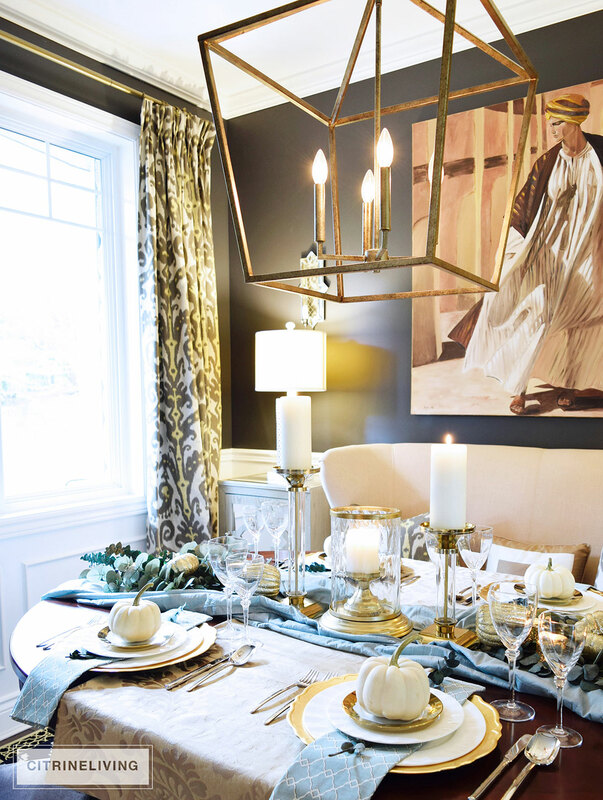 To ground everything, I loosely gathered a curtain panel (which has now found a new life as a tablecloth/runner!) and underneath that is a gold runner I made many years ago. 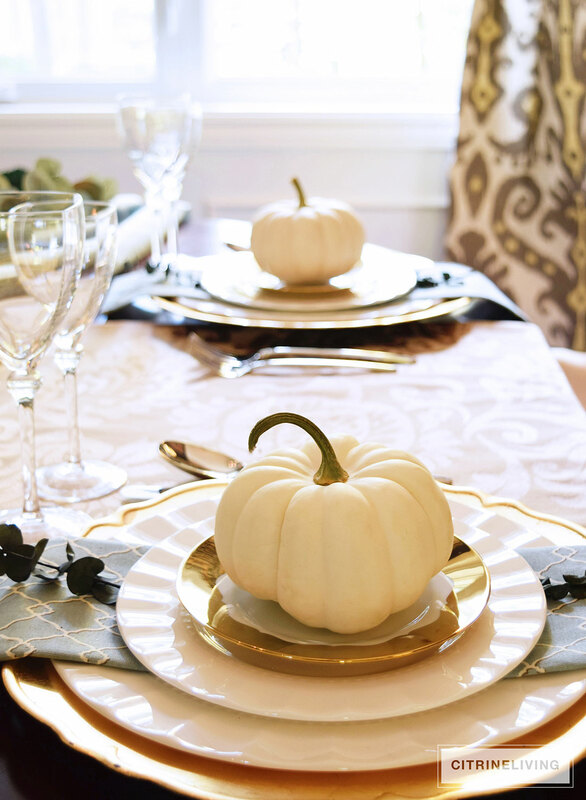 The tone on tone pattern is a subtle feminine note and adds another layer to the table. 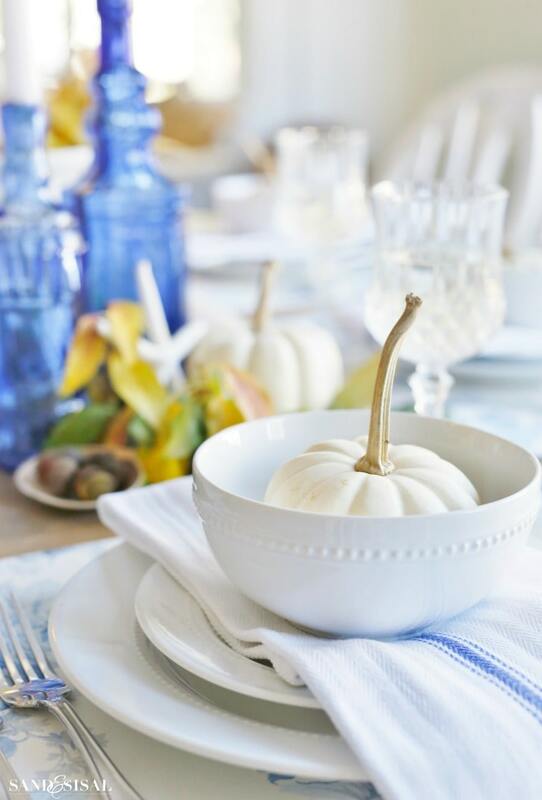 My mini white pumpkins have lasted all season long and I just love their versatility – I’ve used them all over the house this Fall. 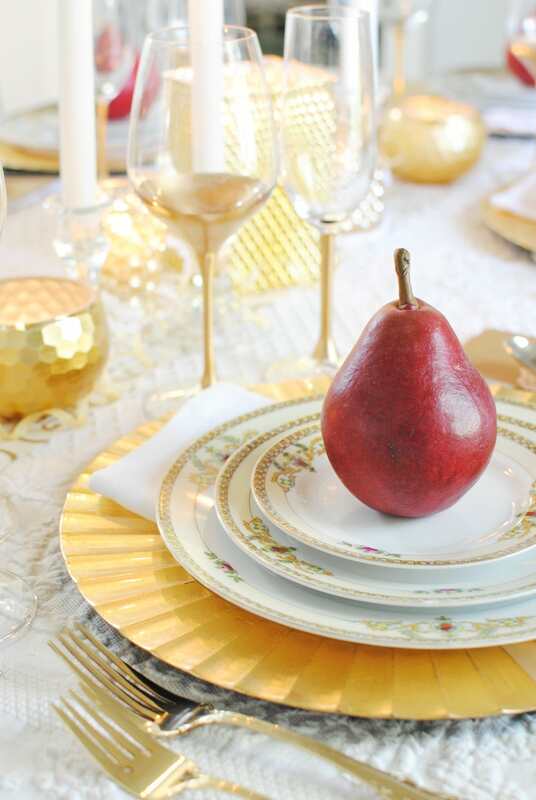 Mixing faux and real elements is fun and it allows you to try unexpected things on your table. 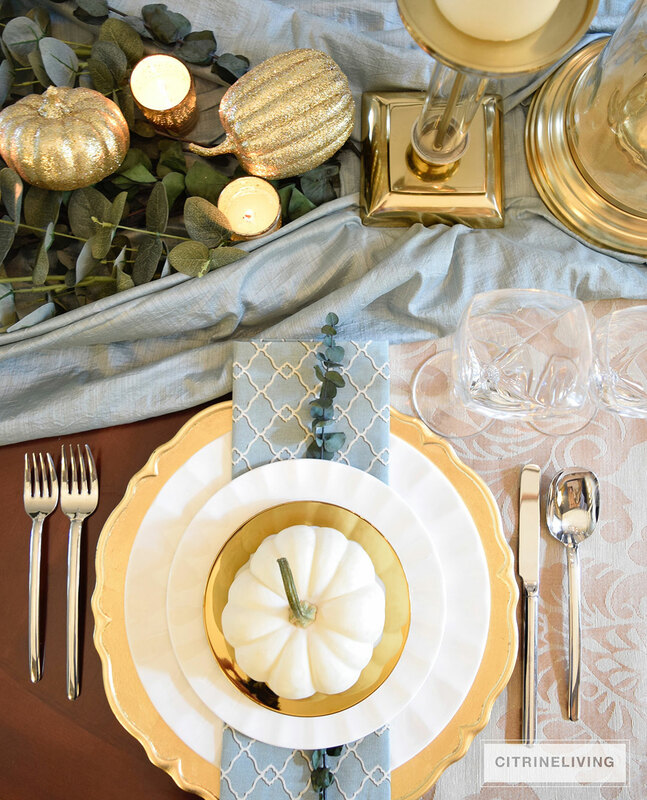 The gold chargers and desert plates add yet another layer, and their similar shape echoes the trellis print of the napkins, which tie both the aqua color and pattern of the plates together. 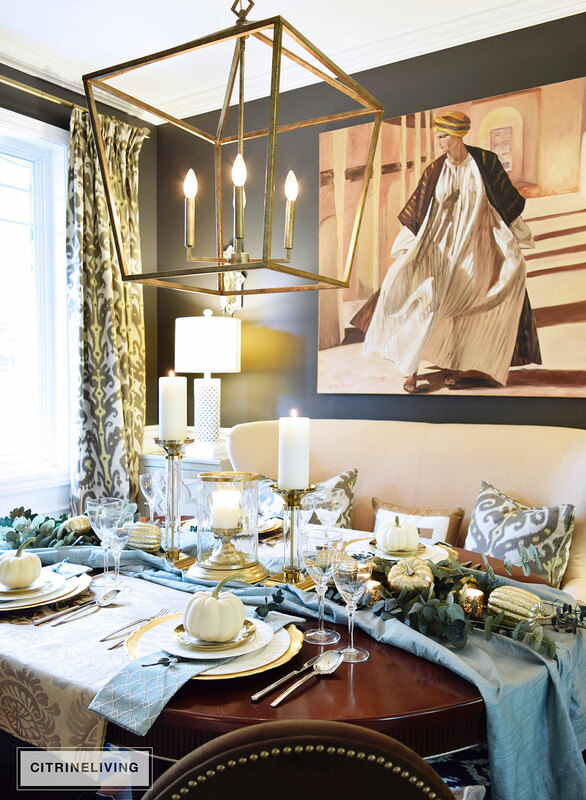 How elegant is the blue-green color paired with gold? 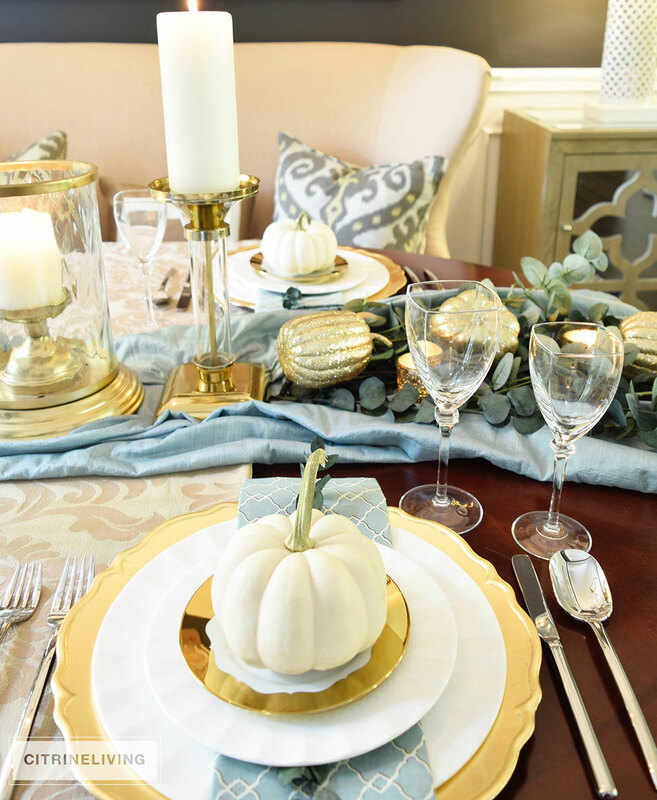 Scattered mercury glass votives and the glitter of the pumpkins helps brighten up the eucalyptus, which may otherwise look somewhat dark on this table. I love the mood it all brings to the space as well. I decided to bring in a pair of lamps from our master bedroom to add some ambiance. 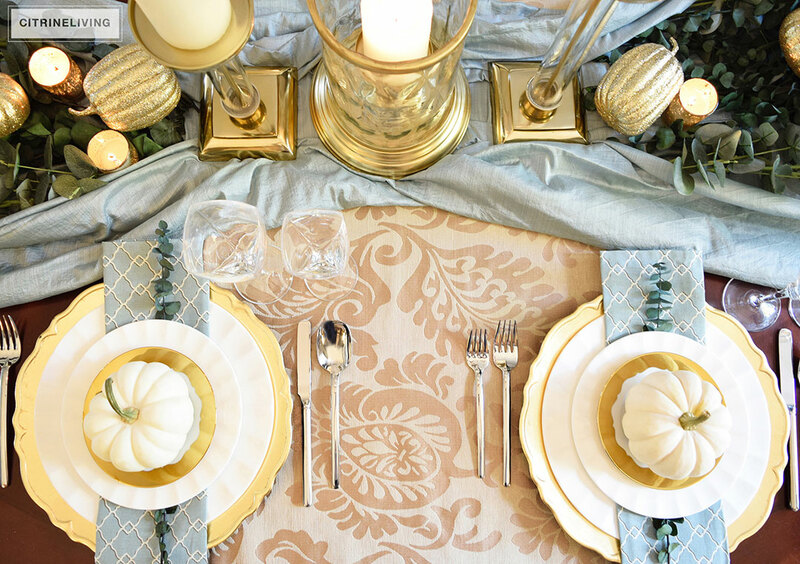 The candles and lamplight creates the perfect warm glow for the gold pumpkins. 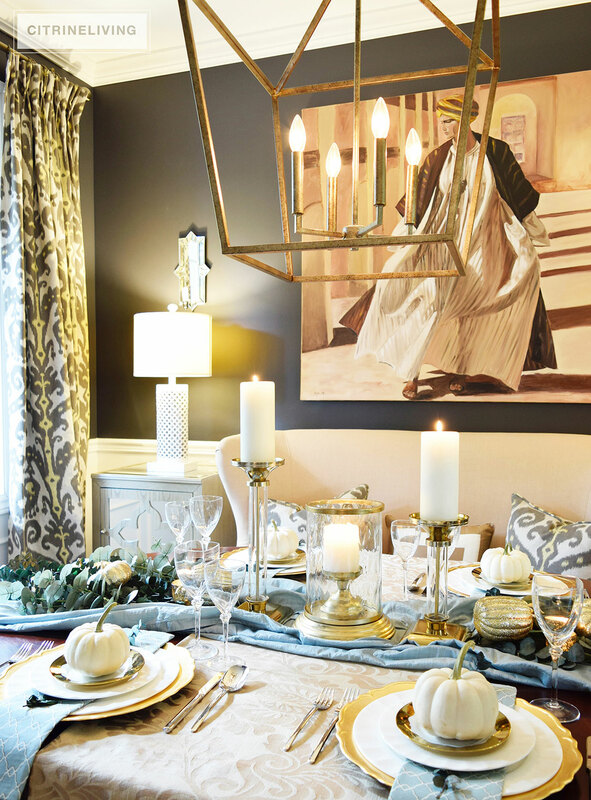 We have a very layered, eclectic dining room and I wanted to bring a feeling of warmth and coziness using various layers of lighting. 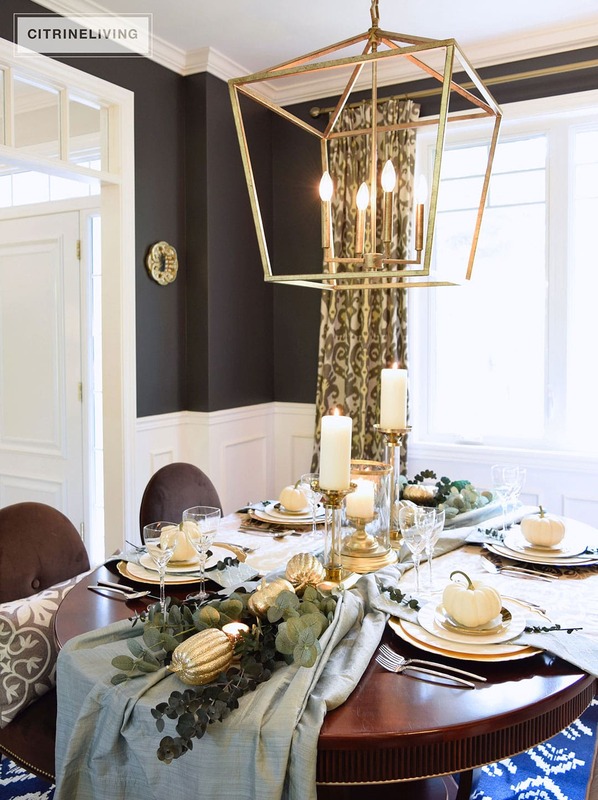 And even though there are dominant colors and pattern in the space, I still wanted to bring a specific theme to the table. I love to experiment with different combinations to see how it will turn out. If there’s anywhere to try it, it’s on your table! Have fun creating and enjoy the process! Thank you so much for stopping by, please make sure to visit everyone on the tour today as well! 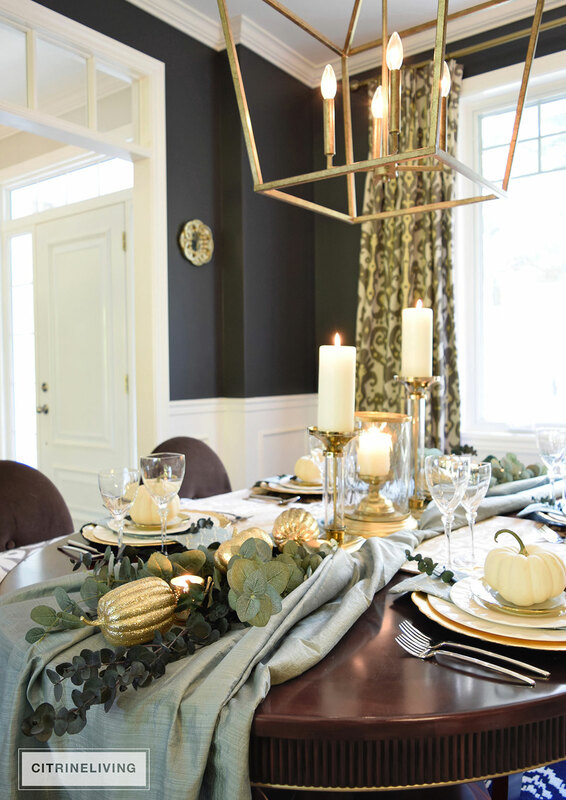 You can see yesterday’s lineup and come back later in the week to see the what’s coming – beautiful tables, recipes and tips for your entertaining this Thanksgiving.